Africa’s mobile phone giant, itel Mobile has unveiled its latest smartphone flagship into the African market – itel A32F. The revolutionary device is one of the best budget-friendly smartphones, which also features the latest Android Oreo™ (Go edition) Operating System. 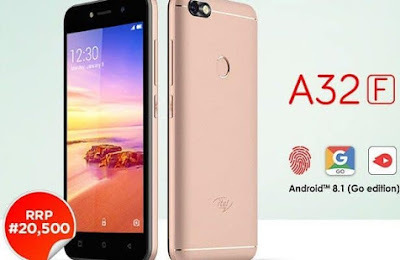 The new itel A32F is a confirmation of itel commitment to partner with Google to launch a series of new devices that runs on Android Oreo™ (Go edition) operating system. Designed specifically for young, independent smartphone users as well as artisans, the latest mobile device will be itel’s first entry level fingerprint smartphone for this market’s generation. Reeling out its characteristics, Oke Umurhohwo, itel’s Marketing Communications Manager said: It enhances data efficiency, Speedy and Security with Fingerprint Recognition and Eye-catching edge-curved metal design with stunning display. Speaking on itel’s successive upgrade of itel A32F against its predecessors, Oke Umurhohwo, said based on an inherent belief in every user’s right to progress, itel is consumer-driven to provide mobile devices that integrates performance, functionality and value. The device runs on Android 8.1(GO edition) and is powered by 1.3GHz Quad-Core processor which features 1GB RAM, 8GB internal storage, expandable memory up to 32GB. It also comes with 2MP+5MP front and back camera with a 2050mAH battery capacity. It is sold for 20,500 Naira in any store.